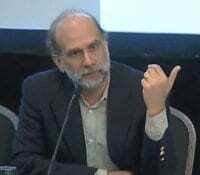 Speaking on the way personal user information is handled by large data aggregates such as social networks, Bruce Schneier gets to the point of obscure privacy policies and the issue of restricted customer choices. It’s a common delusion that people don’t care about privacy; that young people don’t care about privacy, that by the active being on Facebook we demonstrate we don’t care about privacy. That’s largely complete nonsense, and anybody who pays attention to people knows that’s true. People care a lot about privacy. There’s a couple of things going on, and Facebook is in the deliberate business of making sure you don’t think about privacy when you’re there, right? They make money the more you post, the more you link to. There’s been great research done at the Cambridge University looking at about 40 different social networking sites, and all of them very deliberately hide any kind of indications about privacy in order not to make it salient. A lot of good psychological studies show that people don’t think about privacy unless they are made to think about it. I mean, you’re on Facebook to talk to your friends, and especially young people, they know it – if they don’t go on Facebook, they don’t get to talk to their friends, they don’t get invited to parties, and they never get laid. I mean, your social life starts failing, so you have, basically, no choice. And you can’t make a decision based on privacy, there are things more important. With that being said, young people spend a lot of efforts trying to control their privacy on sites like Facebook. Danah Boyd who studies how teenagers use the Internet has documented a lot of this: people engage in the wall scrubbing, people use aliases and people trade information about privacy settings; they do things both allowed and not allowed to control their privacy because it’s important to them. They deliberately try to make your privacy settings obscure. I mean, ask any teenager, and they’ll tell you what privacy is, from their friends, their parents, their teachers. We’ve all been there. Humans have not changed. What’s going on is we now have these socio-technical systems that are intermediating these exchanges. They have a different agenda. They deliberately try to make your privacy settings obscure. There’s a lot going on here. I hear a lot about the death of privacy. And honestly, I hear it a lot by CEOs. I mean I’ve had quotes from Scott McNealy of Sun Microsystems, Larry Elison of Oracle Corporation has talked about it, Mark Zuckerberg of Facebook, Eric Schmidt of Google, all talking about the death of privacy. And this has been predicted for, you know, years. When the camera was invented, you could read about the death of privacy; when the audio recorder was invented, when the video recorder was invented – there are lots of books, it’s always been a big seller: “No Place to Hide” by Robert O’Harrow recently; Simson Garfinkel’s “Database Nation”, “The Transparent Society” by David Brin. 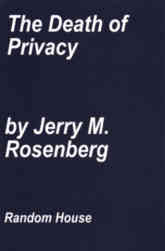 There was actually a book in 1969 called “The Death of Privacy”, where you can read the same things we’re talking about now. Just because the technologies exist – doesn’t automatically mean they’re being used in this way. Just because guns exist, doesn’t mean we’re all going to start shooting each other. Just because cameras exist, doesn’t mean photographing each other naked is inevitable. And I really think the death of privacy is being talked about by the people who want to kill it. And this is important. I talked about technology and law, and corporations: technology determines what’s possible, laws determine what’s legal, and then corporations determine what’s profitable. And then on top of that people get a couple of options, only what the other steps give them. And we’re seeing a world where, I think, laws are largely abdicating and giving the users very little choice. We don’t even have a consumer relationship with a lot of these companies. I really think the death of privacy is being talked about by the people who want to kill it. So to a very real extent I think that data is the pollution problem of the information age. I mean, think about it, all processes produce it, it stays around. What we’re talking about here is the secondary uses, how to dispose of it. And we don’t know what the future is going to look like. And also in a real sense, we’re not actually building the future. We in this room are building tools so our children could build the future. And I believe just as, you know, we look back at the kinds of industry from 100 years ago and wonder in amazement how they could completely ignore pollution and they rushed to build the industrial age, we also are going to be judged by our great grandchildren on what we did to deal with this data in a rush to build the information age. And these questions are really important. And it’s not enough to say: “Oh, people don’t care about privacy” or “Oh, they’re clicking the licenses, it’s too bad for them”. We are actually trying to set policy that determines what our world will look like.